Member of City Council. Calling her fellow Democrats to Arms. Virginia hails from Arkansas and Texas. She was born at home in Siloam Springs, Arkansas (home of Harding College, where special prosecutor Kenneth Starr went to school) and (like Ken Starr and like George McGovern) Virginia is a preacher's kid. She has also been Owner/Manager of Papercraft Printing and Design since 1975. 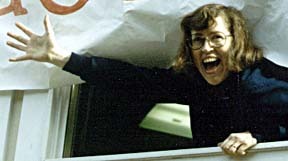 Virginia Daugherty began her first term on City Council in 1992 and on May 7, 1996 won reelection bid to serve a second term. When last asked, she continues to support the President.